Eliza Graham is the author of Playing With the Moon (2007) and Restitution (2008.) Her third novel, Jubilee (2010), is set in the Vale of White Horse in Oxfordshire, where she lives. The cover shows an idyllic, watercolour image of a young girl running in a field. Her back is to the viewer, evoking Jessamy, 10 year-old daughter of Evie Winter who vanished during a village celebration of the Queen’s Silver Jubilee in 1977. In 2003, Evie dies and her niece, Rachel, is left to sort through her belongings at the farmhouse, Winter’s Copse, where she finds a series of letters that Jessamy’s uncle, Robert Winter, wrote to Evie from a Japanese prison camp during World War II. Jubilee consists of several, loosely connected narratives. Rachel’s story is told directly, as she tries to make sense of her cousin’s disappearance, and to come to terms with her own childlessness. Infertility is a running theme in the novel, as Evie also had difficulty in conceiving, which makes the loss of her daughter even more poignant. Evie’s history is retold in the third person, while Robert speaks through his letters. The long reign of Elizabeth II gives structure to the linked plotlines, spanning sixty years. The Queen herself becomes a symbol of endurance, and a more traditional, rural way of life under threat in this most ‘English’ of settings. Another important theme is that of the ‘outsider’, which is how Evie’s rival, Martha, describes her. Evie first came to Winter’s Copse from London as an evacuee during World War II, whereas Martha, like Robert Winter, is from an established local farming family. Rachel, whose parents lived abroad but whom was a frequent visitor to Winter’s Copse as a child, understands Evie’s sense of not fully belonging. The two women’s shared experience of infertility and loss also excludes them from the cosy world of motherhood. Additionally, Martha feels that she has been denied her birthright when Evie marries into the Winter family, and Robert and Jessamy are both torn from their roots by circumstance. Jubilee is an engaging, well-crafted novel. The story and characters, while moving and dramatic, are rendered quite subtly, never overreaching itself. It makes for a pleasant, thoughtful read, and with its intriguing narrative and strong female characters, would probably adapt well as a radio or magazine serial. 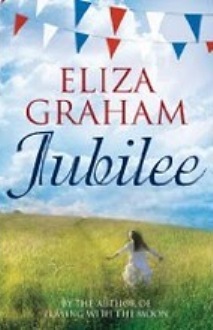 As a reader, I sometimes felt that the emotional impact could have been conveyed more forcefully, but nonetheless, in Eliza Graham’s capable hands, Jubilee has a quiet authority which Queen Elizabeth might well approve of. Was thinking of reading this book. Your write up has made that definite, thanks!